"Building Health and Sustainability at an Intertribal Boarding School"
The Circle of Nations School, an off-reservation intertribal boarding school serving 4th-8th grade students, aimed to 1) promote student health and sustainable local food systems; 2) educate students on the inter-connectedness of people, plants, and the planet; 3) help students gain better nutritional habits; 4) help students grow a portion of the food they eat at school; and integrate these lessons into the curriculum. Our success has been astonishing. Established in 1904 as a government-run rural agricultural training institute, its 40 remaining acres are a visible "green spot" in the surrounding development. Construction: 1) We needed to remove hazardous materials (primarily lead paint and asbestos -- we are about 95% asbestos free, not bad for a school built in 1904) and recycle as much as possible during a major construction and repair project. All during the project almost everything that could be recycled was; there were several hundred light ballasts, light bulbs, metal from structures, and even the concrete and block from buildings were recycled. Environmentally-friendly new campus buildings include a dormitory and an administration building. 2) Given our extreme climate, we were faced with significant expenditures for heating buildings and running window air conditioners. Student Health: The student population is at high risk for diabetes, which is epidemic among American Indian people. We aimed to 1) promote student health and sustainable local food systems; 2) educate students on the inter-connectedness of people, plants, and the planet; 3) help students gain better nutritional habits; 4) help students grow a portion of the food they eat at school. Another important goal was to integrate these lessons into the curriculum. Our curriculum features a Native American “companion planting” scientific method, diabetes prevention skills, educating the school community on the world-wide importance of Native agriculture: corn, tomatoes, peppers, squash, beans, potatoes, pumpkins, chocolate, vanilla, and sunflowers, among other global contributions. Energy: Circle of Nations installed a geothermal heating and cooling system to serve its energy needs, replacing a 50 year-old steam system. Initial utility cost savings were $85,261 compared to the previous school year. This year, we expect to at least double the savings, thanks to several features we enabled in our building automation system. The utilities savings includes the cost of an additional 130 outdoor high pressure sodium lights installed throughout the campus as part of the facilities improvement and repair project which funded the ground source heat pump system in 2006. The ground source heat pump and HVAC system has improved living, learning and working conditions in the eleven buildings on campus. Partnering for Healthy Food and Outdoor Spaces: The food service program aims to get students and families eating more fresh fruits and vegetables. Our Strategic Instruction Model connects nutrition with math, reading, science, physical activity, arts education, culture, parents and community. The project promotes physical fitness and eating more vegetables and fruit instead of high-calorie, low-nutrition meals or snacks. 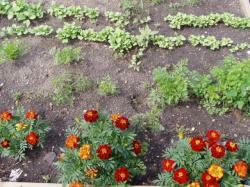 Students grow bedding plants from seed and transplant them to the school garden with family and visitors. Families take home garden seeds and culturally relevant how-to books such as Buffalo Bird Woman's garden by Gilbert L. Wilson, the classic account of Native American agricultural techniques in ND history. We've had many partners along the way. Circle of Nations applied to the "Green & Growing" school garden initiative to promote student health and sustainable local food systems. The ND Department of Agriculture contributed start-up resources for a school kitchen garden to promote good nutrition and local sustainable food systems. A National Gardening Association grant supported traditional Native American scientific companion planting methods and classroom activities. The county soil conservation district collaborated on construction of a nature garden in the Medicine Wheel design, planted with native prairie flowers, sacred plants and grasses. Outdoor Wildlife Learning Site volunteers built and maintained Bluebird Rescue boxes along the north edge of the campus. And Boy and Girl Scouts planted trees on campus. Wildlife: Facilities staff has delayed mowing in past years to allow a nesting population of bobolinks to hatch and fledge. In addition, Circle of Nations has partnered with the Chainkpa Park and Zoo for environmental education projects. For example, students adopted an injured eagle for its lifetime in a Native drum ceremony attended by the public, and students created and auctioned off their own artworks to support other zoo creatures. The changes we've made have had quite an impact: We have reduced emissions of greenhouse gases by reducing fuel consumption and installing high efficiency lighting. We have eliminated some transportation and refrigeration costs for fresh produce. We have provided habitat for birds, bees, pollinators and other wildlife. This year a pair of Eastern Bluebirds was able to nest in an old tree with holes that was left standing for cavity-nesting birds whose habitat has been almost eliminated in the area. We have not yet established a formal Green Team. Our informal green team has consisted of facilities, food service, school health, academic and residential representatives. This team operates in consultation with Native American environmental constituents and key staff leaders and partners from the greater community who have all contributed to the living and learning environment at the school. The students met with the architect several times to state their needs and provide input into the new dormitory design. Students also serve on the school safety committee and perform environmental inspections with the school safety officer. The planning and implementation took 5 years, roughly from 2004-2009. We were motivated by many factors, including cost savings, environmental health, environmental citizenship, and the desire to teach environmental awareness and life skills to our youth. The school is exploring wind energy possibilities. The preliminary work of grant writing and proposals is completed and we plan to pursue this in the near future. Students are involved in design study and research of wind energy turbines. Rob Peck attended building automation controls training (for ground source heat pump, closed loop system for heating and cooling) and believes the knowledge from this training will cut another 10-15% from our utility bills. The scheduler feature will allow us to reduce the use of the heat pumps in the classrooms at night or during the day when students are not in the dorms. Also, the new outdoor lights are capable of being controlled through the building automation controls, allowing us to shut off lights when students are not on campus. The response to the renewable energy systems has been astounding. Many people and organizations interested in renewable energy have visited the campus or called with questions. Find a way. Communicate with those on the other side of the barrier. In the Three Sisters Garden, by JoAnne Dennee and Carolyn Peduzzi. Buffalo Bird Woman's Garden by Gilbert L. Wilson, the classic account of Native American agricultural techniques in North Dakota history.